University of Rhode Island (URI) researchers involved in a Coastal Resilience Center of Excellence (CRC) project demonstrated their project’s simulations in a joint training exercise last month with the Rhode Island Emergency Management Agency (RIEMA) and Federal Emergency Management Agency (FEMA). Pam Rubinoff, right, and Dr. Austin Becker, second from right, instruct participants in a June training on preparation for “Hurricane Rhody.” Photo via the University of Rhode Island. 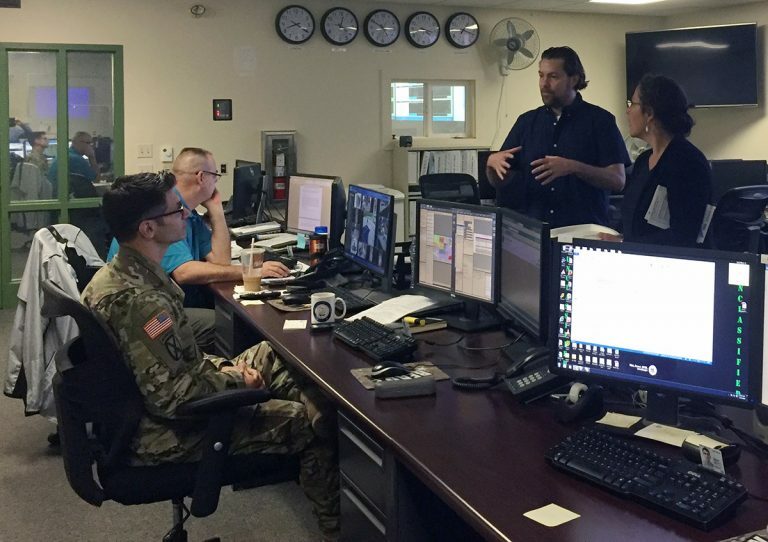 The Integrated Emergency Management Course (IEMC), held from June 19-22 in Warwick, R.I., used the project’s “Hurricane Rhody” simulations in a four-day exercise that took the place of the traditional annual preparedness conference. The exercise, attended by more than 100 emergency managers from Rhode Island municipalities, state agencies, non-profit organizations and FEMA Region 1, focused on response to hurricane scenarios and while identifying key actions taken before, during and after a hurricane. The course included three days with presentations on emergency management and emergency operations center activities. Day 4 was an exercise in the State Emergency Operations Center (EOC) and five municipal EOCs, which were connected virtually. 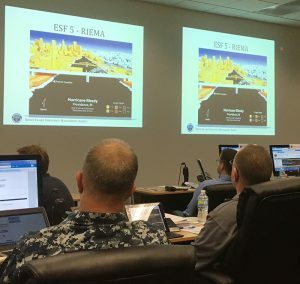 Outcomes from the course will provide RIEMA with an opportunity to enhance overall preparedness, while actively testing modeling outputs during various parts of the course. The CRC project led by Dr. Isaac Ginis, “Modeling the combined coastal and inland hazards from high-impact hypothetical hurricanes,” includes the development of an advanced, multi-modal ensemble system used for realistic computer simulations of hurricane hazards and impacts. 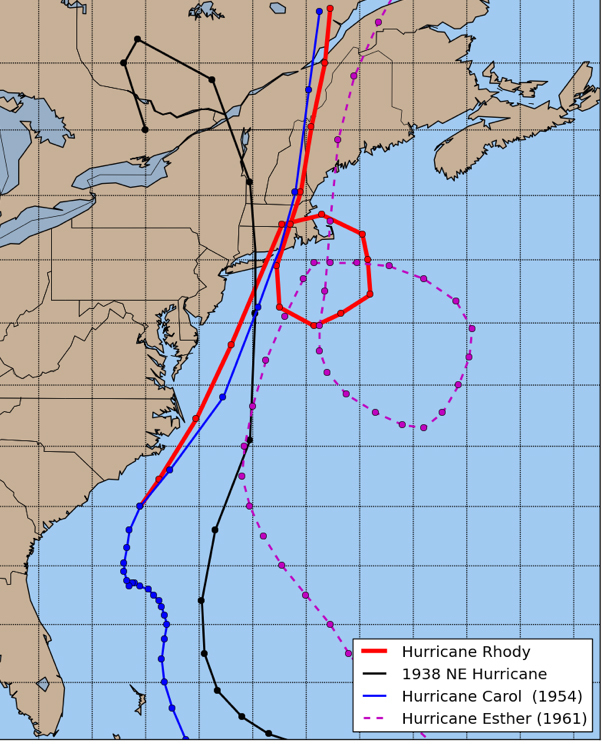 “Hurricane Rhody” is a hypothetical storm that would directly impact Rhode Island, developed by simulating high-impact historical and hypothetical worst-case scenarios by combining multiple hazards elements – including wind, waves and coastal flooding due to storm surge. Dr. Ginis recently received a Microsoft Azure Research Award, a one-year grant that allows the project team to utilize cloud computing technology to develop models and other three-dimensional visualization products most useful for use by emergency managers, first responders and other professionals. The hypothetical Hurricane Rhody, shown in red. The URI team included Associate Coastal Manager Pam Rubinoff as the Principal Investigator of the course and outreach liaison; Dr. Ginis as lead of the modeling team along with Chris Kincaid and David Ullman; Dr. Austin Becker as lead of the impacts assessment and visualization lab along with PhD student Peter Stempel and Masters student Bobby Witkop; and Tougaloo student Courtney Hill, a participant in the CRC’s SUMREX program. To create a realistic training environment, the modeling team at URI partnered with RIEMA and FEMA to develop “Hurricane Rhody” scenarios and impact visualizations. Impact analysis for Rhody was developed in collaboration with the Department of Homeland Security Office of Cyber and Infrastructure Analysis, RIEMA and FEMA Emergency Management Institute. Impact analysis also included collecting “thresholds data” of facility mangers’ specific concerns about hurricane damages to their facilities. Graduate students in Marine Affairs developed new expert elicitation methods designed to integrate this qualitative data with the hurricane model. The URI Marine Affairs Visualization Lab then developed high-resolution 3D visualizations to show how impacts of concern would occur as the storm advanced. These new integrated capabilities enhance how emergency managers can understand how critical infrastructure, utilities transportation will be impacted by major hazard events. Participants viewed this hypothetical storm with many of the tools used to prepare for existing storms. The National Oceanic and Atmospheric Administration’s National Weather Service Office in Taunton, Mass., developed hypothetical tropical storm advisories and hazard graphics, along with daily weather briefings, for the exercise. Employees from FEMA Region I implemented the Hurricane Rhody scenario into the DHS S&T recently transitioned HURREVAC-eXtended (HV-X) storm tracking and decision support computer program used by state and local emergency managers as well as federal agencies. Participants in the training view simulations of hypothetical storm impacts on Rhode Island. Photo submitted by the University of Rhode Island. Rubinoff said the event was a success, and the URI team has been invited to present their modeling tools and visualizations to FEMAR Region 1 leadership and practitioners in September. RIEMA is already considering using the presented materials for further trainings and exercises to update state materials to current threat standards.